In Sumatra, the northern-most island of Indonesia, the significant reduction of forests and a threefold increase in the human population over the last two decades have placed Sumatran Asian elephant populations in jeopardy, evidenced by the escalation of conflicts between elephants and humans. 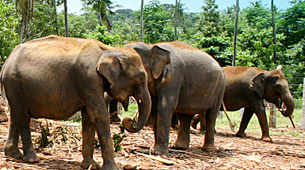 Elephants that wander into human settlements are often relocated to conservation centers in Sumatra. In fact, more than 700 elephants have been relocated to these centers. However, insufficient knowledge and funding have resulted in a serious lack of food and care for the elephants, resulting in many losses. In response, the IEF has funded and organized a number of trips to the Sumatran Elephant Conservation Centers (ECC) to deliver medical supplies and provide training. IEF elephant experts and veterinarians share information with the staff at the conservation centers on captive elephant husbandry and health care in an effort to make long-term positive changes in the lives of the elephants at the centers; and to protect this important meta population while the Government of Indonesia develops programs for habitat protection and the future of the wild and captive Sumatran Asian elephant. * provide the surrounding human communities means to benefit from the captive elephants and education materials on the conservation of elephants and habitat. In 2004, IEF established Conservation Response Units (CRU) to provide protection for plant and animal species in the region through elephant back patrols of wildlife areas. This project provides useful work for the pawangs (Indonesian mahouts) and their elephants, improves health care and training, and provides the surrounding human communities with education opportunities on the conservation of elephants and habitat. The long-term conservation of the elephant in Sumatra requires that elephants and people co-exist with minimal conflict, otherwise demands for the removal of elephants will be politically difficult to ignore, resulting ultimately in the depletion of elephant populations on the island. The Conservation Response Unit (CRU) concept is founded on the belief that diversity is only secure when diverse conservation strategies are employed. The CRU model utilizes once neglected captive elephants and their mahouts for direct field based conservation interventions to support the conservation of wild elephants and their habitat, and achieve positive outcomes for both elephants and people. By creating this link, and ensuring that these elephants are seen as an important resource and doing positive deeds, it is expected that local communities, decision-makers and other stakeholders will recognize their contribution and hopefully focus greater attention on protecting Sumatran elephants, in the wild and in captivity. The CRU teams are composed of 14 captive elephants from two ECCs (Aceh and Seblat) and 14 of their mahouts, 14 government forest rangers, and 3 conservation officers spread over three CRU posts placed in targeted working areas. The CRU project has 4 main objectives: 1) mitigating human-elephant conflict; 2) reducing wildlife crime activities in the important elephant habitat through forest patrol and monitoring; 3) raising awareness among local people of the importance of conserving elephants and their habitat; 4) establishing community-based ecotourism to ensure long-term CRU financial sustainability. Captive elephants play an important role by providing transportation during forest monitoring patrol activities, as a tool for gaining local community interest during awareness events, and driving away crop raiding wild elephants should conflict incidents arise. Mahouts, as part of the CRU team, not only take care of the elephants but are involved in all CRU activities and have gained training in wildlife observation techniques and basic use of navigation devices and mapping.